How Does Passion Flower Help Me Relax? There are many species of passion flower, though it is the Passiflora incarnata that was used by Native Americans to treat insomnia, anxiety and any other condition requiring a calming influence. Although it is used today for the same purpose, its mechanism is not yet fully understood. There are many theories, however, one being that levels of the inhibitory neurotransmitter gamma-aminobutyric acid (GABA) in the brain are increased. It is known that GABA depresses brain activity and generally relaxes you. 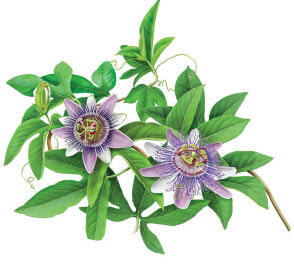 It is believed that passion flower helps convert glutamate into GABA, making you feel more relaxed. Although, this herb, can be used to control hyperactivity, its use with hyperactive children should be carried out only under a professional physician because test results on children are scant. What works with an adult should not be considered suitable for children, or even pregnant women, unless under strict medical supervision. If you are easily excitable, find it difficult to sleep, tend to feel anxious, particularly when under stress, or are even prone to seizures, then passion flower extract should help to calm you down and relax. It is easy to take, and can help relieve pain by using the natural activity of neurotransmitters in your brain.